The last summer may not be memorable for sunshine or heat but for me and my ears it was most definitely was a hot one. In the span of a few weeks I had gone to several concerts and my ears where now complaining. Ever since I can remember my ears would ring after having a ‘good’ night out, you know the sort where you spend hours drinking and shouting just so you can be heard in a night club. I never really gave it much thought, generally the point I noticed the ringing usually coincided with the point of maximum return from my investment in that nights alcohol i.e. beyond caring!!! The ringing in the ears I suffered went away by the next morning and combined with other things I had to worry about – like my pounding head, it never bothered me!! I went along to see Dolores O’Riordan of The Cranberries fame on her one night only gig at the Koko club in London’s Camden Town back in June. Gig was great but boy was she loud, so loud my ears starting singing their own tune. Journey home was just constant ringing in my ears but it was a ‘good’ night out, so no problem. There was a problem however when I woke the next morning I still had ringing in my ears and the morning after that. It was actually 4 days till the ringing totally disappeared. Two night later and I was at Wembley Stadium watching Muse but this time I bought along some foam type ear defenders which just block out sound, so I was having to remove them for the songs I did like – otherwise all I heard was thumping sounds. During them four days of personal hell I did some research and realised that what I was experiencing was a call to arms. If I did not want to get Tinnitus permanently something had to be done to protect my hearing from loud noise (or music). I had now entered in to a situation where I had to be constantly aware of the noise levels around me and make sure I could protect my hearing. What I needed was hearing protection, something I could put in to my ears which would just turn down the volume without effecting the tonal quality of the sound – hearing protection designed for musicians. Musicians ear plugs are special in that they try and reduce the sound level by a fixed amount while maintaining a flat frequency response. The ear plugs that most people are familiar with are foam or rubber types used on building sites and loud environments, there sole purpose is just to cut of as much sound as possible and you can check how that sounds just by sticking your fingers in your ear. They make everything sound muffled and dull, not exactly pleasant especially when you have paid good money to be at a concert. 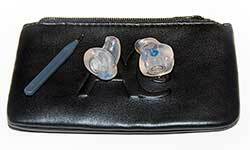 I tried some of the lower budget musicians ear plugs from Alpine and Elacin. They generally offer about 20db of attenuation and are of a generic fit, so ideal for most people. For the price they are great for ad hoc use and I would recommend everyone have a set with them just in case. They do have several drawbacks, frequency response is not that flat and fit comfort is not that great. If you have very small or large ears you may have problems getting a good seal between plug and ear, this also makes them uncomfortable after long periods of use. 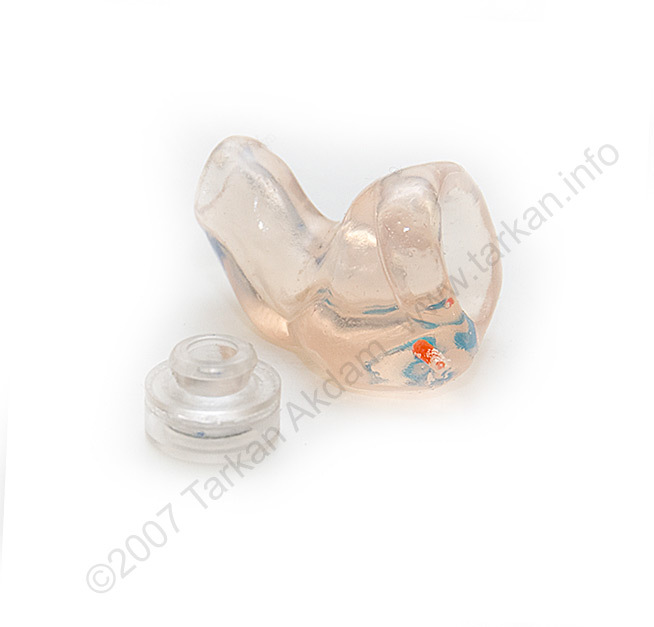 I finally decided to go for some custom ear plugs and the best known product is Elacin’s ER range FlexComfort hearing protectors. 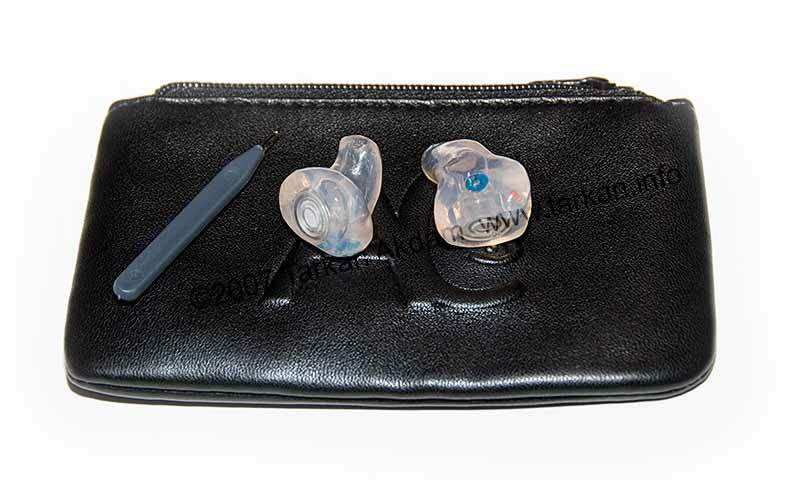 The ear plugs are made from a soft silicon material and are fitted with an ER filter, there is a choice of 3 filters each offering a different level of attenuation – 9db, 15db and 25db (ER9, ER15, ER25 respectively). The filters are removable, so you can try another attenuation level if your not happy with your current level. First things first, I had to get some goo injected in to my ears to get an impression made of my ears. 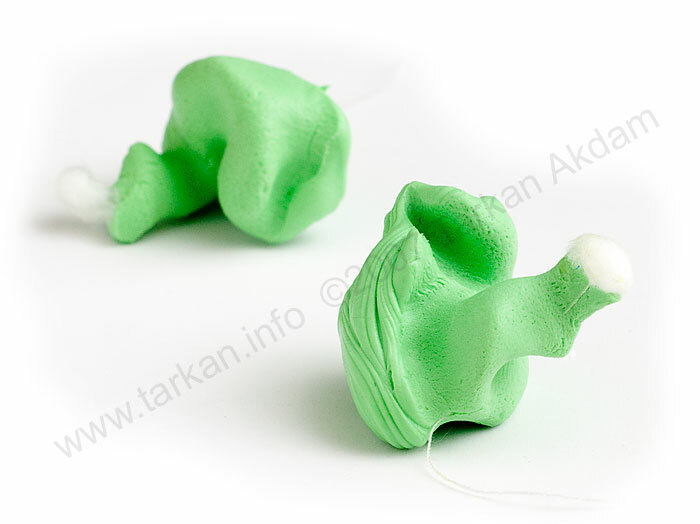 The goo is a silicone based two part material which sets after about 5 – 10 minutes, these impressions are used to produce a mould which is then used to produce the earplugs. A tip for when you get this done – move your jaw around while the material is setting, reason for this is that when your jaw moves the shape of your ear canal changes this helps to remove any voids before setting. I kept opening and closing my mouth till the materials started to harden about 5 minutes, or if you prefer you can bite on a large pen or permanent marker. 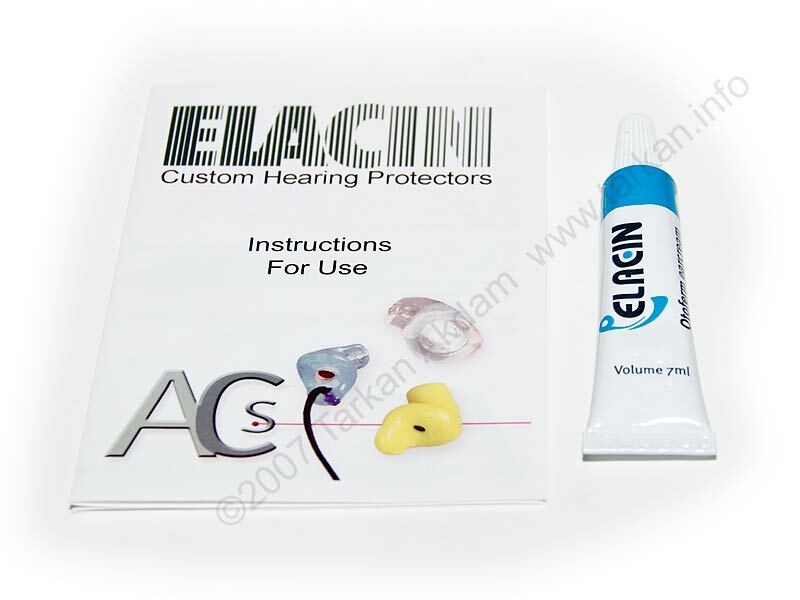 The impressions were sent of to the lab so they can make the earplugs, Elacin have licensed various labs around the world to make the earplugs – here in the UK it is Advanced Communication Solutions (ACS). The turnaround time is about 2 weeks (I got mine done a bit quicker as I had the Prince concert to go to in 10 days). Earplugs are supplied fitted with the filters you requested, in my case I ordered the ER25 which provides 25db of attenuation. You also get a storage pouch, wax remover / cleaner tool and a small tube of ear comfort cream. I decided to also get an extra pair of filters, ER15 which provide 15db of attenuation – this was so I had another set of filters to try if 25db of attenuation was too much. The earplugs are marked with blue and red dots, red signifying the right ear and blue for the left. It takes some practice to fit for the first few times. Plugs go quite deep in to the ear canal so you cannot just push them in, you need to hold them up to the ear in an upside down position and slowly rotate them while pushing them in. The rotation is clockwise for the right ear and anti-clockwise for the left ear, it becomes second nature after a few times. I do suggest using the comfort cream for the first few times of use, the lubrication allows the plugs to glide in very easily – this allows you to get a feel for how they fit in to the ear without hurting yourself. The ear canal is very easy to bruise and can become sore very quickly. Once fitted I found the earplugs to be very comfortable, they are malleable and soft enough not to cause any discomfort when you open and close your mouth. While being very comfortable you never really forget that they are in your ears – I put this down to the fact that they go very deep in to the ear and the silicon material is not porous nor breathable (which would kind of defeat the whole purpose of earplugs). I think over time you become more accustomed to them and start to forget that you are wearing them. The fit is very good and the amount of isolation and attenuation that you get from the silicon earplugs is just amazing. A simple test is placing your finger tips over the filter ports and you become totally cut off from the world – you cannot hear anything!! Elacin rate the earplugs to last about 4 years, I suspect you could probably use them for lot longer but they do say that the shape of your ear canal does change over time. Only you can be the judge of that!! Keeping them clean is very easy, after removing the filters the earplug shells can be washed – do not get the filters wet or you will ruin them. I would think plain water with maybe a very small amount of household detergent is all that is needed to get them clean. I would recommend buying a packet of sterilizing (alcohol) wipes and just wiping the outside of the earplugs once or twice a month – earplugs can be a very easy way of spreading and prolonging ear infections, proper hygiene is essential. Thank you very much for this review, it’s very useful.